Contemporary Americans are not the only ones who purchase expensive exercise equipment in the hope of achieving physical fitness. Eighteenth-century English gentlemen (and likely a few ladies as well) used this peculiar-looking device, left, to help burn off the effects of those infamously lengthy Georgian dinners. Called a chamber horse, it was designed to replicate the up-and-down motion of horseback riding. How did it work? The "rider" sat on the seat with his feet on the floor or step (some models like this one featured a step that pulled out, like a drawer) and his hands on the side arms. Inside the bellows-like leather portion were tiers of metal springs, divided by wooden boards. When the rider pressed down, the springs gave way with a certain resistance, then bounced the rider back up again. This bouncing was supposed to mimic horseback riding, and was considered excellent exercise as well as a cure and preventative for everything from nervous diseases to that all-purpose catch-all ailment, the "spleen." Henry Marsh of Clare Market claimed to be the inventor of the chamber horse, and he was advertising them for sale in 1739. They became very popular in the later 18th c. with exactly the same kind of people who buy treadmills today: affluent people who are too busy for outdoor exercise, or who don't like to work out in bad weather, or don't really feel up to anything more strenuous. Surviving examples vary in the details. The more expensive ones masquerade as fine furniture, with mahogany frames, Moroccan leather, and brass nail heads. Even the cabinetmaker Thomas Sheraton showed them in his catalogues. The bouncing must have been fun, too, since a version was made as a nursery ride for the children of King George III. Considering how the King and Queen Charlotte had fifteen children, the vigorous action of the chamber horse might have been popular in the palace as a way to wear out all those little princes and princesses. But like modern exercise equipment, the fad for chamber horses passed, and by the late 18th c., they were falling were out of fashion. Also like modern equipment, there were likely many chamber horses that were purchased, used for a few weeks or months, and then abandoned to the attic or lumber room. Used ones appear frequently in auction catalogues; Jane Austen mentions them in her unfinished 1817 novel Sandition: "And I have told Mrs. Whitby that if anybody inquires for a chamber-horse, they may be supplied at a fair rate – poor Mr. Hollis's chamber-horse, as good as new – and what can people want for more?" To see an antique chamber horse in action (at least what action there is), fast-forward this video clip to about the 1:15 mark. Left: Regency Mahogany Chamber Horse, courtesy Christie's Auctions. Oooh! Have you seen To The Manor Reborn, a BBC dcumentary about the fitting out of Avebury Manor with new, period accurate furniture and decor, so that peple can interact with it all? It has the most exquisite Georgian dining room, including an exercise horse chair like this one. Brilliant! you find the coolest stuff. When I first saw this…I thought - that is the weirdest birthing chair ever. exercise chair….ah that makes more sense. But really, why not just ride the darn horse? (I feel the same about treadmills). Try riding a horse or taking a walk at minus twenty degrees Fahrenheit and a 35 mph wind. I wonder how people actually ate those multi-course meals. Did they take a tablespoon of each item? Incredibly interesting! How funny to us now, it makes me wonder how they will view our treadmills in 200 years! 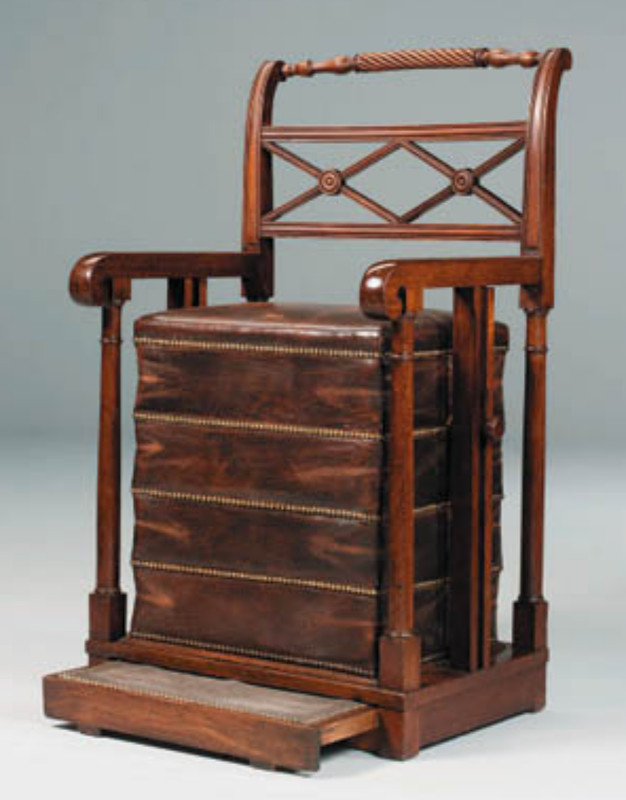 I remember rather upsetting a guide in a Georgian house in Dublin when I was able to correctly identify the exercise chair and told him I had seen one previously in a country house in England. I had the feeling I had deprived him of one his highlights in giving the tour of the house as most visitors were not able to identify the chair. I think the one I saw in England was at Chatsworth.